When Sasha goes on holiday, she is expecting just a wonderful time alone with her mother. However, she becomes aware that she is being followed by a strange man. He approaches her telling her that she must swim naked at four in the morning and from a sense of fear Sasha complies. When they return home he appears again, telling her to go for a run every morning at five o’clock. At the end of the run she must urinate in a bush. Once again through fear she complies. At the end of each task Sasha vomits gold coins. 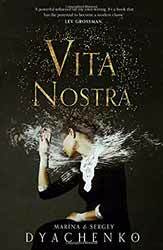 Vita Nostra (2018. 404 pages) is a Russian novel by Marina & Sergey Dyachenko. The book was translated by Julia Meitov Hersey. This is the first English translation to be published. If novel is a vague way of describing the book it is because it’s a difficult book to compartmentalise. Part philosophical rumination, part examination on the nature of fear. The title translates as ‘Our life’ and in many ways the book is about the life of the main POV character, Sasha. Having undergone the potentially humiliating rituals she is told that she has won a place at the Institute of Special Technologies. There the book follows her through her semesters which consist of lessons which appear to be meaningless, ending in examinations which seem unpassable. The book sits somewhere between magic realism and science fiction, although at times it almost feels like a horror story. The reason that Sasha continues her strange education is because she is convinced that her recruiter, Farit Kozhennikov, can affect reality to harm her family, if she does not comply. For much of the story the reader is never quite sure if this is circumstantial, Sasha projecting her fears on random events, or whether the irrational can be rational. The narrative is written in such a way that the reader experiences all of Sasha’s fears and uncertainties. Suffering is a common theme in Russian literature, all the way back to the seminal work by Dostoyevsky’s Crime and Punishment (1866) and Notes from Underground (1864) and thematically there is a large element of growth through fear which runs through Sasha’s experience. It’s a shame so little of their books have been printed in English as this is serious and thought provoking. I particularly liked the idea of words creating a reality, which is, of course, the shared experience between author and reader. Just because Sasha attends an institute which seems to defy objective reality, this is as far from Harry Potter that you could get. Even the mundane can seem mesmeric in a book which questions the human condition and the nature of reality. You do get an ending and in some way an explanation of what all this was about, but mostly the book just wants you to think.